Gallia Academy baseball coach Rich Corvin (2) gives a stare down to the home plate umpire after leaving a meeting on the mound during a May 14 Division II district semifinal contest at Rannow Field in The Plains, Ohio. Gallia Academy baseball coach Rich Corvin (1) goes over ground rules with then Wellston skipper Pat Hendershott (32) during an April 28, 2006, regular season contest in Wellston, Ohio. CENTENARY, Ohio — In the end, it was more about quality than quantity. 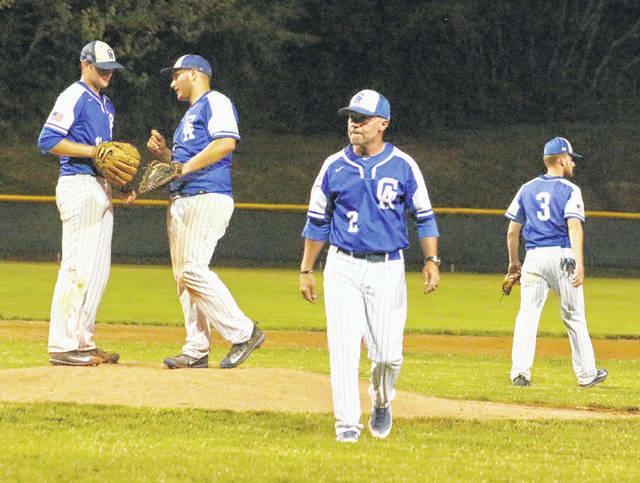 Rich Corvin has stepped down as head varsity baseball coach at Gallia Academy High School after 15 seasons in the pursuit of other interests on the home front. 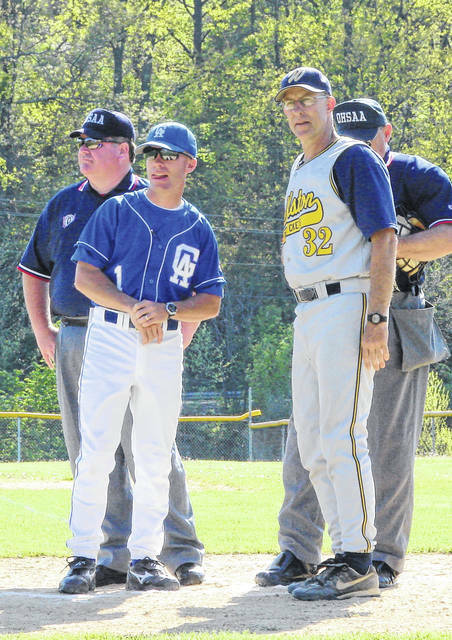 Corvin — who took over as Blue Devils skipper in 2004 — is the program’s all-time wins leader after amassing a 237-138 overall mark (.632) to go along with seven league titles and six district appearances over a decade-and-a-half tenure. The Blue Devils — who hadn’t won a league championship in baseball since 1985 before Corvin’s arrival — ended that drought by winning the Southeastern Ohio Athletic League crown in 2006, then became the only program in SEOAL history to win four consecutive league titles from 2011 through 2014. Gallia Academy also won the 2010 SEOAL South Division crown before losing to Zanesville in the Day of Champions. Corvin’s Blue Devils won an outright title in 2016, the program’s first season as members of the Ohio Valley Conference. GAHS also shared the 2017 OVC championship with Coal Grove. The Blue Devils reached a pair of Division II district finals in 2013 and 2014, as well as winning a quartet of sectional titles in 2007, 2008, 2012 and just this past spring. Corvin — a five-time SEOAL, four-time all-district and two-time OVC coach of the year recipient — noted that the decision to walk away now was a tough one, but the venerable mentor also acknowledged that it’s a choice being made for all of the right reasons. And those reasons — even more than baseball — are closest to his heart. 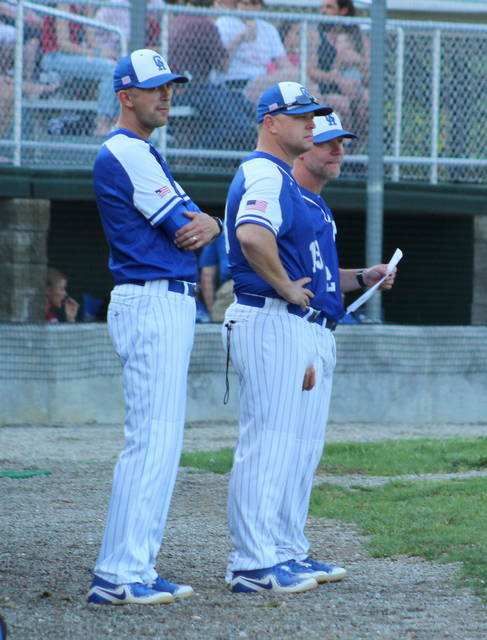 “When they hired me in 2004 after being an assistant for Coach Houchens for two years, I wanted to be that 25- or 30-year guy that was the Gallia Academy baseball version of what Coach (Jim) Osborne was in basketball,” Corvin said. “You just never envision a day where you intentionally walk away, but things do happen in life that become more important. Corvin — who has three daughters, two of whom are still coming through the public school ranks — has been involved in baseball in some capacity since Gerald Ford was President of the United States. Corvin was a standout infielder during his prep days at Wellston, where he graduated from in 1990. He spent a couple of seasons at Marietta College before ending his collegiate career at the University of Rio Grande. After college, Corvin stayed involved in the game by working as an assistant at Wellston under Hall of Fame coach Pat Hendershott (530 wins in 32 seasons), as well as a stint with Rio Grande skipper Brad Warnimont’s staff before ending up at GAHS in 2002. After a pair of seasons under then-head coach Brack Houchens, Corvin was given the reins to a program that had produced just one All-SEOAL performer (Nick Merola) since the turn of the millennium. Corvin’s first two campaigns led to four all-league selections, then came the breakthrough season of 2006 — his first league championship as head coach while producing five all-league reps and his first of six league or divisional most valuable players. Most of Corvin’s building-up process came at Memorial Field, not at the current Eastman Ball Field complex that also has an indoor training facility located just down the left field line. Corvin says those early years at the old field were crucial in getting the program where it is today, mainly because all of the other programs were having success with the facilities that they had to work with at the time. Corvin is much happier to see the baseball program in a facility like Eastman Field — voted the best field in the Southeast District for nine years running — as the Blue Devils move forward, but the venerable mentor has never forgotten about where it all started … even though he hasn’t been by to pay respect to the old friendly confines in a while. “The good old days of dragging Memorial Field or cleaning carp off of it after it flooded. We’ve really come a long way in 15 years,” Corvin said. “We have a history of great players, but I was fortunate to have some really good young athletes when I took over the program. I felt like we had the talent to do what the football and basketball teams were doing at the time because we were using the same kids, but it took a little time to get the kids to take that same pride in baseball. Once we earned that trust with the kids, and started putting the work in year-round, the program just took off. Corvin also says of all the things he wished for at the time in 2004, good help was right at the top of the list. As he noted, that was one wish that definitely came true. Corvin — who was inducted into the Wellston Athletic Hall of Fame in 2008 — says baseball and family are the two greatest things to ever happen to him in his lifetime. He also believes that the two men that have made the most impact on him personally come from those specific areas. 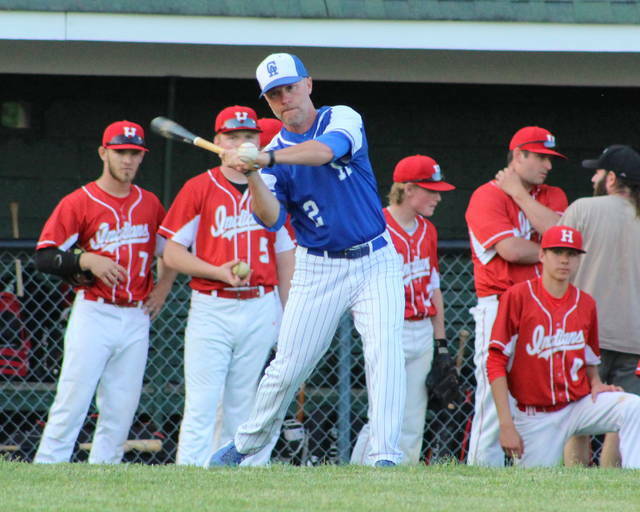 During Corvin’s tenure at GAHS, the Blue Devils baseball program has produced 16 collegiate players — including a handful of Division I athletes — as well as a Major League Baseball draft pick in Austin King back in 2009. Gallia Academy baseball has produced more than 40 all-league recipients, close to two dozen all-district selections and a half-dozen All-Ohio representatives under Corvin’s watch. More importantly, Corvin has impacted the lives of hundreds of people by simply using baseball to prepare young men for the biggest game of all … the one called life. And, over the years, Corvin believes that he and his staff have succeeded in that area. Corvin — who will continue teach at Gallia Academy — admits that next spring will probably be a stiff test, being away from a game so dear to him for the first time in roughly 40 years. When asked about having any regrets about his 15 seasons, the answer was shorter than the free advice he offered up to his successor — whoever that might officially become in the upcoming weeks. Corvin — the son of Richard and Jean Corvin — will be spending more time with his wife, Batina, and their three children, Tori, Courtney and Katie Belle. The Corvins reside in Gallipolis.